Be a divine velvet diva at the pool in this A-MA-ZING swimsuit! This retro beauty gives you the perfect pin-up look due to her halter top with pleated sweetheart neckline and super flattering skirted typical fifties front. Suits all body shapes and is incredibly slimming thanks to the composition of the fabric and the clever design. 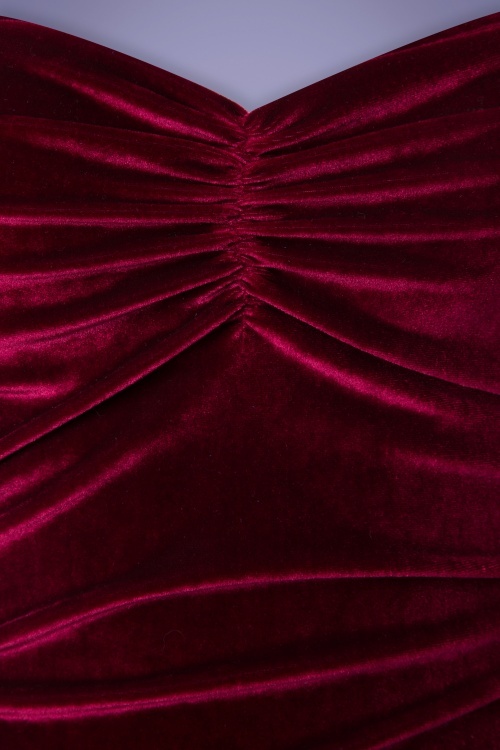 Made from a luxurious, soft and stretchy, burgundy red velvet fabric for the ultimate vamp look. Your vintage swimwear collection just can’t do without this showstopper! een badpak met een stof die je niet vaak zult zien ! het perfect alleen als je een kleine buste hebt zoals mij valt het nogal los bovenaan .